Saturday is our Spring Raptor Release - rain or shine! The event is 11am to 2pm, with program starting at 12noon. 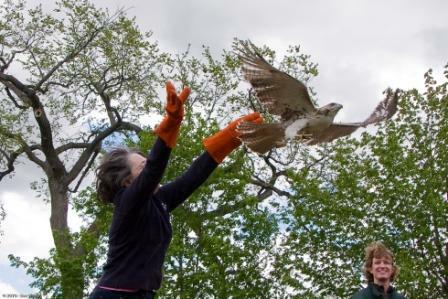 Meet our education raptors, and watch as we release several rehabilitated raptors. Please bring your used ink jet printer cartridges to benefit our Recycling for Raptors program. Is there a place that we can mail used ink jet cartridges if we don't live in the area? Raptors of Minnesota Free for Mom's! Chick Returned to the Nest! Baby Raptor Species is a Turkey Vulture!